YouTube (i.e. Google) has put itself in the midst of a music industry conflict that may yet turn into a much needed process of soul searching for the labels as they weigh up whether YouTube’s contribution to their business is net positive or net negative. The controversy surrounds the imminent-ish launch of YouTube’s premium subscription service and the refusal of some independent labels to sign the terms Google is offering them. Whereas normally this would just result in a service launching without a full complement of catalogue, in this instance YouTube is also the world’s second largest discovery platform after radio. YouTube execs have been quoted as stating that labels that do not sign their terms will have their videos blocked or removed. Exactly from where (i.e. the main YouTube service, or the premium offering) remains a matter of conjecture with both sides of the debate more than happy to allow the ambiguity cloud the debate. But the fundamental issue is clear either way: YouTube has become phenomenally powerful but delivers comparatively little back in terms of direct revenue and is now happy to flex its muscle to find out who is really boss. The record labels, indies included, have to take much of the blame here. They let YouTube get too big, and on its terms. The big labels had been determined not to let anyone ‘do an MTV again’ and yet they let YouTube do exactly the same thing, getting rich and powerful off the back of their promotional videos. But this time YouTube’s resultant power is far more pervasive. Labels are beholden to YouTube as a promotional channel. They have turned a blind eye to whether its ‘unique’ licensing status might be stealing the oxygen out of the streaming market for all those services which have to pay far more for their licenses. The underlying question the labels must ask themselves is whether YouTube’s inarguably valuable promotional value outweighs the value it simultaneously extracts from music sales revenue. Indeed 25% of consumers state that they have no need to pay for a music subscription service because they get all the music they need for free from YouTube (see figure). This rises to 33% among 18 to 24 year olds and to 34% among all Brazilians. Of course the aspiration here is that YouTube is finally going to start driving premium spending, but reversing into a subscription business from being a free only service is far from straightforward. It is far easier to make things cheaper than it is to raise prices, let alone start charging for something that was previously free. Add to the mix that free music is not exactly a scarce commodity and you see just how challenging YouTube will find entering this market. 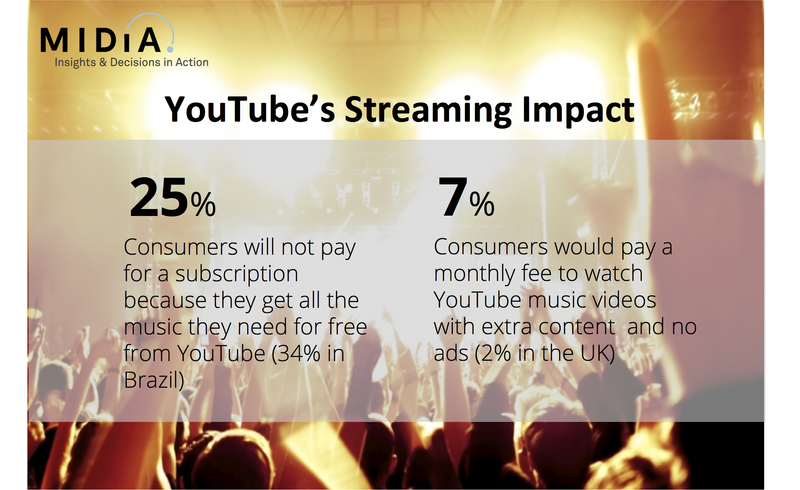 Indeed, just 7% of consumers are interested in paying a monthly fee to access YouTube music videos with extras and without ads. The rate falls to just 2% in the UK. The counter argument is that only a miniscule share of YouTube’s one billion regular users are needed to have a huge impact. But if the price the music industry pays to get there is to kill off the competition then it will have helped create an entity with such pervasive reach that it will truly be beholden unto it. If the music industry has hopes of retaining some semblance of power in this relationship, it must act now. This entry was posted in Ad Supported, Amazon, Apple, Google, Independent Labels, Major Labels, Spotify, Streaming, Subscriptions and tagged Amazon, Apple, Google, Indies, Spotify, Streaming, Subscriptions, YouTube, YouTube Susbcription by Mark Mulligan. Bookmark the permalink. Why don’t all the labels pull their music from YouTube and put it on Vimeo, or one of the other video platforms? The fans will find the music wherever it is uploaded. What about labels being able to require an ad run before all videos of their music (with no option to skip ad) thereby generating revenue for the label from those that want to listen for free while at the same time discouraging those who do not want to watch an ad from listening for free. If the choice was between ad or ad-free, with no middle ground, maybe more people would be motivated to pay for a music subscription service. Enjoy listening to your favourite songs on Spotify but would like to copy them as mp3? Stay with me to discover just why people are utilizing Spotify rippers to convert their favoured tunes. Spotify is an innovative music player software, It offers anyone to stream unlimited music from all your top music artists for totally free. It is actually available in 2 versions, free and premium. The premium version is a membership-based that means for a monthly service charge you can enjoy to music advertisement free and of better quality. Spotify is available for Windows, Mac, UNIX as well as in a mobile version for phones like the Apple iPhone. More details can be found on the Spotify website.